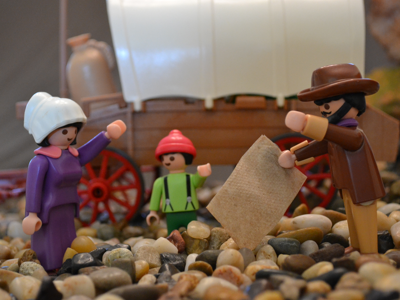 You can use the analogy of the pioneers on the Oregon Trail as a way to think about your retirement planning. These stalwart individuals mapped which landmarks would show they were making progress and what they needed to do to reach each of them. They set out in late April or early May from Independence, Missouri, with the daunting goal of crossing the mountains and reaching their new home before the first snows closed the pass. Let’s look at traveling the Oregon Trail of retirement from leaving Independence, Missouri, at age 25 to your arrival in Retirement Valley by age 65. On the Oregon Trail, you couldn’t always start early. The prairie had to be covered in new spring grass to feed and support your team of oxen. In life you need a job that can support your lifestyle and still leave you some money to save and invest. Normally you can start by age 25. Just as the pioneers averaged 15 miles a day, you should set a goal of saving an average of 15% of your lifestyle spending every year. By age 31, you should reach Fort Kearny, Nebraska, the first landmark of retirement. Ideally, you should have saved enough to fund your spending for an entire year. Save 15% for six years, plus a little growth, and you should have 100% of what you spend in a year. This first year’s worth of spending is the most important because it has the greatest number of future years to grow via the magic of compounding returns. This one year of spending will have grown to about seven years of spending by age 65. And if allowed to continue maturing, this one year can provide the spending for the last 17 years of life between age 83 and 100. Delay saving these first six years and it will be difficult to fund the last 17 years of your retirement. At age 35, retirement pioneers pass Chimney Rock and Courthouse Rock in Nebraska where you should have saved two times your annual spending. At this point you will leave the flat Platte River Valley. The terrain will get rougher and more challenging as you try to make progress saving while also raising a family. At age 41, you should enter Wyoming and reach Fort Laramie with four times your annual lifestyle. Fort Laramie marked the beginning of the Rocky Mountains. If your lifestyle gets too steep, you may be falling behind on the many multiples of your lifestyle you have saved. This is a good time to lighten your retirement load by reducing your spending. The trail after Fort Laramie was littered with dumped supplies. The weight of your lifestyle is as deadly to retirement as was the weight of unneeded heirloom furniture, stoves and extra food to the pioneers ascending the Rockies. With your load lightened and your determination unflagging, you will reach Independence Rock and Devil’s Gate in the middle of Wyoming with six times your annual spending before age 46. Here’s the good news: Unlike the Oregon Trail, progress on the retirement trail accelerates with the magic of compounded interest. It is as though the journey is mostly downhill at this point. As long as you don’t put on the brakes, whatever you have already saved grows to add to your progress. By age 51 you should reach Fort Bridger, Wyoming, and have nine years of spending, and at age 55 reach Fort Hall, Idaho, and have 12 years. These forts were not well populated. With 10 times your annual spending, you have left most Americans behind and are traveling among the few rugged individuals who are preparing to take care of themselves in retirement. Before age 61, you should pass 17 years of spending and Fort Boise in Idaho. The goal is to reach The Dalles, Oregon, by age 65 and have about 23 times your annual spending. Navigating these last few years are as critical as making it through the high mountains before an early snowstorm. Sufficient growth with just the right amount of stability is crucial. Many retirement pioneers are discouraged, having funded only about half their goal at age 55, not realizing they are on track with only 12 times their lifestyle a decade before retirement. The Dalles, Oregon, was notable as the end of the Oregon Trail. Here pioneers loaded their wagons onto barges and floated down the Columbia and then the Willamette River. From there they sailed right into Oregon City. The five years between retirement at age 65 and age 70 offer unique opportunities. By age 70, retirees must be taking both Social Security and required minimum distributions from their IRAs. If they have already stopped working, there may be years where there is a gap in their income. With proper planning, these gap years can be filled with Roth conversions realizing income in the lowest tax brackets. A Roth not only moves money where it will never be taxed again, but it also lowers the required distributions later in retirement. With careful planning and pacing you should be settled beyond Oregon City and living off a generous safe withdrawal rate by age 70. Subscribe to Marotta On Money and receive free access to the presentation: 10 Money Ideas in Retirement.